The full marathon witnessed a participation of around 27, seeing international participation for the first time. The half marathon saw a participation of 103 participants and the 10km had 259 runners. The 5k timed run had around 316 participants and the untimed 5km had 390. The 3km fun run saw the greatest number of runners, with over 1028 people running this race category. The Marathon route included the service road from NITK Surathkal to the junction near GovindaDasa College, Surathkal, One side of the NH-66 from GovindaDasa College to Tannirbhavi Junction and the beach road from Sadashiva Temple Surathkal to NITK Beach gate and NITK internal Roads.The Marathon is fully organised by the NITK students with support of NITK Surathkal Alumni Association. The NITK Karavali Marathon 2019 Prize Award Ceremony was presided by DrUmamaheshwar Rao, the Director of NITK, the Chief Guest, Shri Hanumantharaya,IPS, Dy Commissioner of Police (L&O), the Guest of Honour Shri B. PrashanthBaliga, General Manager (Corp Comm), MRPL and the Brand Ambassador for the event, P.T. Usha, the queen of Indian track and field. Hanumatharayappa, IPS, and Prashanth Baliga congratulated the winners and complimented the organisers for arranging the event in a disciplined manner. They also wished that in the years to come, the event has the potential to become one of the top events in this part of the world. The winners of the various categories were awarded with various cash prizes by all the dignitaries present at the venue, along with Mr Krishnamurthy, President of the NITK Alumni Association, Dean Student Welfare Prof JagannathaNayak, Dean AAIR Prof M PandurangaVittal, Dean Academic Prof M B Saidutta and STEP Director Prof G Shrinikethan. 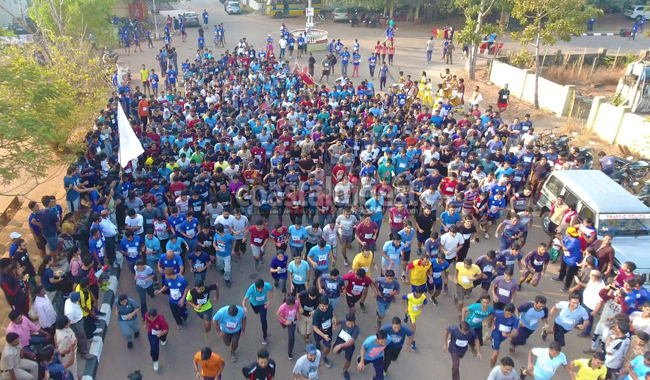 The NITK Karavali Marathon was for a cause to drive awareness on ‘Save the Oceans’ & ‘Run for Unity’ and promote healthy lifestyle amongst youth. Padmashree P.T. Usha, the queen of Indian track and field was present throughout the event. NITK Alumni Association is the first Alumni Association to organise such Marathon among NITs and we are committed to make this event into an event to look forward to and to participate in this part of the world within 2-3 years in a big way. With the NITK Karavali Marathon, NITKS Alumni Association believes that promoting a healthier lifestyle among students of NITK as well in the greater Karavali region is getting the right impetus and awareness.